Type 6: length of frame is 6 metres. Type 9: length of frame is 9 metres. Type 11: length of frame is 11 metres. Sealing: Seal lip with stainless steel spring and stainless steel socket. Capacity: +/- 3350 m³/hour at 540 revolutions per minute. Required capacity: 57kW/ 70PK for normal manure. And 58kW/ 80PK for thick manure. Large capacity, which means the lagoon can be mixed in a short amount of time. No installed power supply required. The entire silo is mixed with an adjustable mixer tunnel. A manure pump is not needed for mixing. The SFS Lagoon mixer has a large capacity. It is powered by power take-off from a tractor or by means of an electric motor. 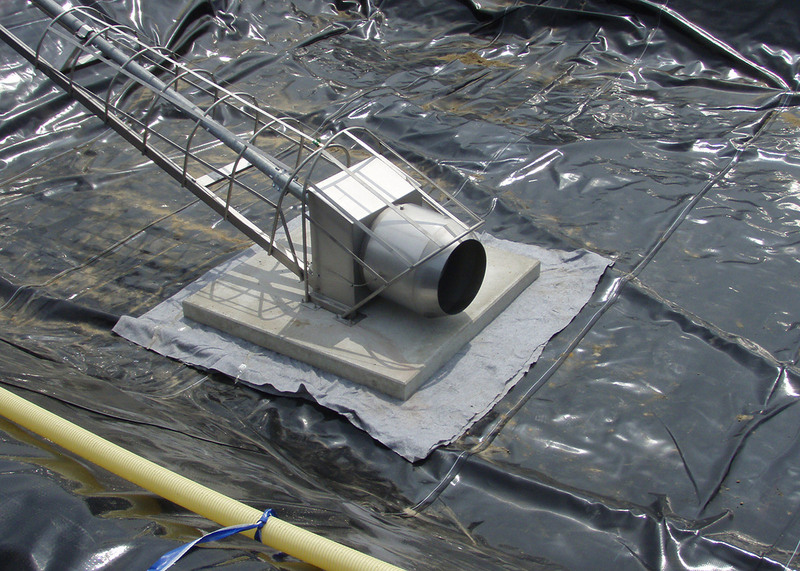 The SFS Lagoon mixer was developed especially for foil lagoons with a floating cover. The mixer with fan is housed in a reinforced stainless steel frame, which means that the floating cover cannot be sucked into the mixer. 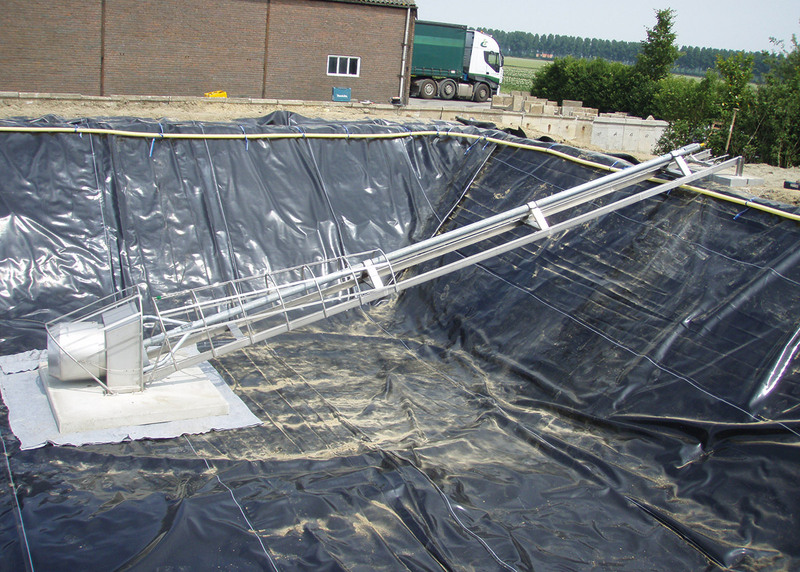 The mixer tunnel is equipped with a conical outflow, which strengthens the thrusting motion of the tunnel even more. The outflow direction can be adjusted easily in a corner of approximately 30°, by way of an operating handle at the top. 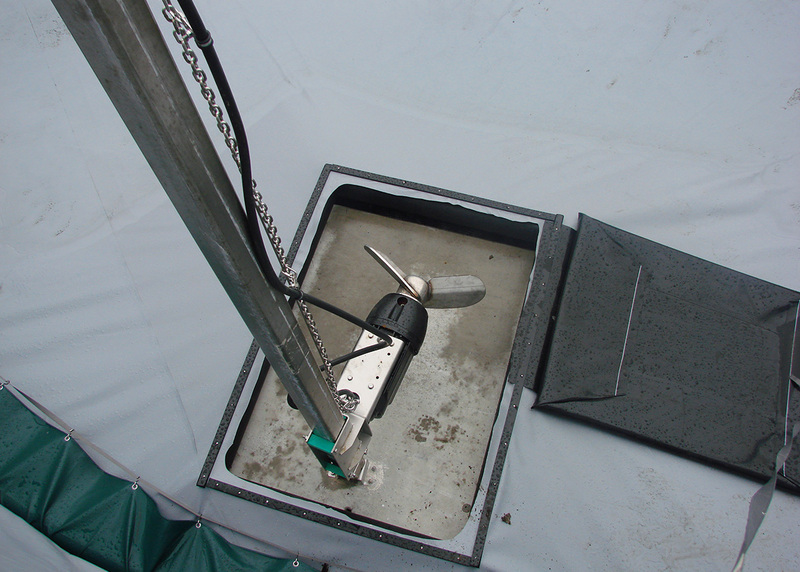 The mixer can be installed in a new or existing lagoon. The mixer is attached to two concrete slabs. The fan head is attached to a heavy concrete slab at the bottom of the lagoon and the drive side is secured to a smaller concrete slab on the dyke's pinnacle. The floating cover can then be pulled across the entire frame. A ramp must be built alongside the dyke, where the tractor can be positioned to drive the mixer.